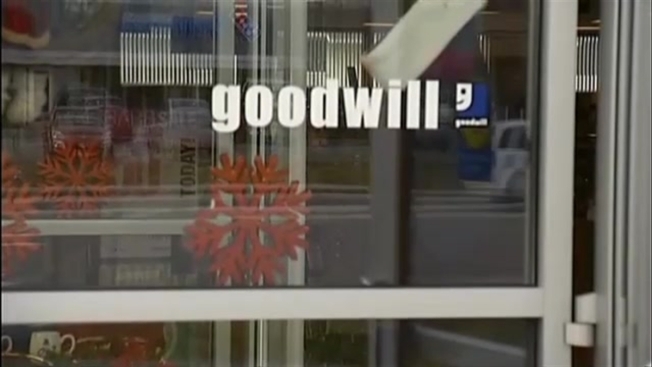 A Goodwill store employee in Portsmouth, New Hampshire returned a big chunk of cash to a woman who had accidentally left it in the wallet she was donating. Goodwill supervisor Marissa Jenness was about to put a price tag on a donated wallet, when she saw something she never expected. "I opened it and shut it real quick and I had to take it in because it was a lot of money," Jenness said. She found six one hundred dollar bills still stashed inside. Jenness took it to her manager, A.J. Carter, who then called police. "We usually don't see anything more than five or $10," Carter said. "We were kind of like, 'whoa.'" Portsmouth Police Officer Andre Woussof went to the Goodwill on Lafayette Road looked at the wallet, and found the faint imprint of a man's name where his credit card used to be. It was John Brickley. Officer Woussof tried to track down John, but instead found his wife. Turns out, Mr. Brickley had died about six weeks ago. His wife, Kathy, told police she had donated a pile of her husband's things and had no idea the cash was in his wallet. "It was like a gift from beyond, so it was nice," Jenness said. An emotional twist even for complete strangers shopping at Goodwill on Tuesday. "So, she got a gift from him back after he already passsed," said shopper Karen Anderson. "That's pretty amazing, that's great." Clinton Outlining Veterans' Health Issues in N.H.
Jenness says Kathy was so moved by her honesty, that she came to the store to meet her. "I could see she was emotional, so it was very, it was exciting," Jennes said. "It made my heart feel very nice just to see that." A Goodwill employee proving that good things do happen to good people. "I like to think I'm putting a little faith in humanity back in the world," Jenness said laughing. NECN spoke with Kathy Brickley via email Tuesday. She said it's been a very difficult six weeks without her husband, and she couldn't bear the thought of being interviewed for this story. Brickley did, however, express her appreciation for all of those involved in getting her husband's money back to her.